Watertown Weltbürger, added masthead: Der Erzähler. David Blumenfeld and D. W. Ballou came here within the same year, 1853-54. Both were able editors, loyal Democrats, powerful and fearless editors. Blumenfeld eventually called his paper the Weltburger. Ballou named his the Democrat. Blumenfeld edited the Weltburger for over 50 years during an era when it was the most widely read newspaper in the city. He was prominent in Watertown society and sired a numerous, talented family, some of whom became linked by marriage with other old families in the city, while others achieved fame abroad. His son Ralph told the adventurous story of his boyhood in Home Town, a book he published in 1944 after a long career as editor of what was then England's, and therefore the world's, largest new paper, the London Daily Express. The elder Blumenfeld died in 1905. Shown: C. Hugo Jacobi, William Voss, David Blumenfeld, Ralph Blumenfeld, Otto Krueger, Moritz Blumenfeld, Charles Blumenfeld. 1890s Weltburger sign, front and back sides. Hung outside the office of the Watertown Weltburger newspaper office at 317 E Main. Dates to the 1890s. Emil Kehl, 502 South Second Street, for 60 years a printer, has retired and has sold his interest in the Weltbuerger Printing Co. to Charles R. Abel, former linotype operator for the Jansky Printing Co.
Mr. Kehl, shown here, is a native of Watertown but left with his parents at the age of eight and settled at Glenwood. There, when he was 11 years of age, he went to work for the Glenwood Tribune, a weekly newspaper which is still being published. He remained with that paper for some time, then went to work in various newspaper and printing establishments, earning as he worked. He worked in Amery and Minneapolis among other places, later returning to Watertown. Here his first job was with the Republican, a weekly newspaper which was edited by the late Granton Norris. He first became associated with the Weltbuerger, then a popular German weekly here, when it was edited by the late David Blumenfeld who was the father of the late Ralph D. Blumenfeld, a famous newspaper editor in London, editing the famed London Express for many years. 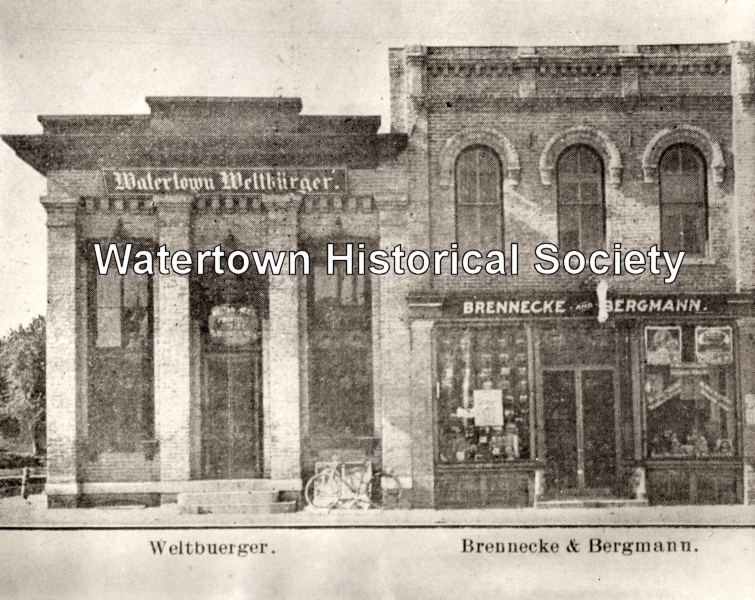 Later the ownership of the Weltbuerger was transferred to Milwaukee and then returned to Watertown. Here Mr. Kehl became associated with the late Otto Krueger and the late Gustav Schwenke in publishing the paper. In 1906 Mr. Kehl left and the paper was published by Mr. Krueger and Mr. Schwenke. In 1930 he returned to Watertown and again affiliated with the publishing concern and remained until his retirement a few days ago. In speaking of his experiences, Mr. Kehl said it has been an interesting career. He witnessed the rise, and decline of the German newspaper here, for the Weltbuerger is no longer being published. For a time, after it was no longer edited locally, it was being published in Winona, Minn., and Mr. Kehl served as the local subscription and advertising representative. He recalls how many difficulties the late Mr. Blumenfeld had in getting out some issues of the weekly which was then in its heyday. The Weltbuerger, in recent years the Weltbuerger Printing Co., has enjoyed prosperous business in the job printing line and Mr. Kehl says he feels certain that it will continue under the present owners—Adolph Jaeger, who went to work with the Weltbuerger in 1906, and the new partner, Mr. Abel. In addition to doing all sorts of job work, the company gets out such publications as the Northwestern College monthly magazine, The Black and Red, as well as the college high school paper and it also does considerable work for the Bethesda Lutheran Home and their clients. In recent years new equipment has been added to the printing establishment and it enjoys a wide clientele. 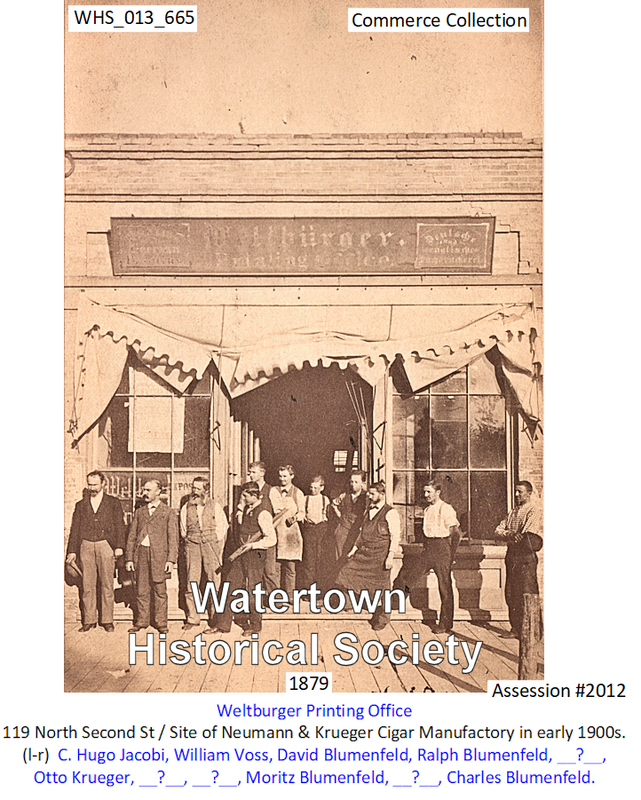 Wepeo Printing Company is the oldest printing operation in Watertown. Founded in 1852, the original "Weltbuerger Printing Co.", published one of the leading German weekly newspapers in Wisconsin. 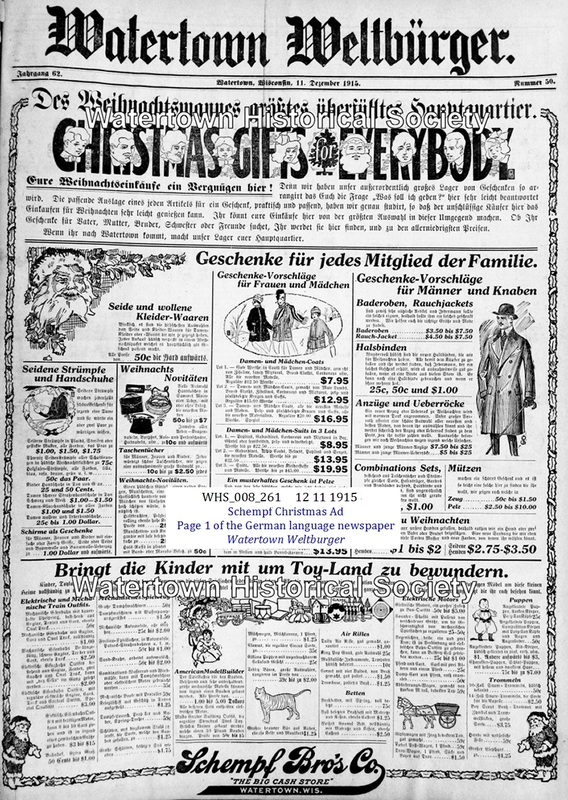 The newspaper, titled "der Weltbuerger" was published until 1932 when English became the dominant language and the business turned to a commercial printing operation. At that time the business shortened its name to Wepco Printing (Weltbuerger Printing Company). Time magazine, 01 02 1933: Last week the 80-year-old weekly Watertown (Wis.) Weltburger ceased publication. Famed German-language publication, it had been edited by Liberal Carl Schurz at one time and by Ralph Blumenfeld, now board chairman of the London Daily Express. Since 1930 the Weltburger had been published by National Weeklies, Inc. in Winona, Minn.
01 29 1915 Moritz F. Blumenfeld appointed State Superintendent of Public Property; born in Watertown in 1859, learned the printer’s trade and was associated with his father, the late D. Blumenfeld, in the publication of the Watertown Weltberger.